Average sold price was $431,763 for detached single family (DSF) and $285,801 for attached single family (ASF) homes, up 12 and 11 percent, respectively, compared to a year ago. Continued demand is expected to push average sold price for DSF and ASF to around $450,000 and $300,000, respectively, by early summer. 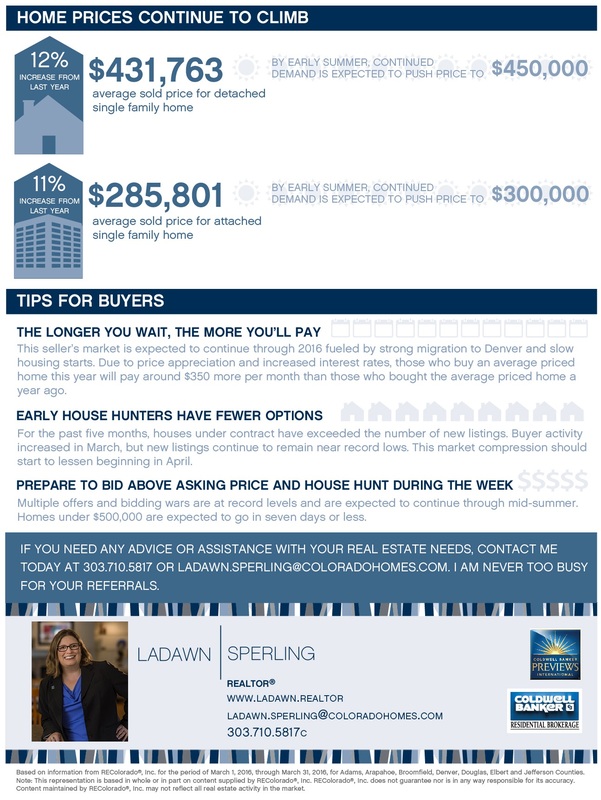 The longer you wait, the more you’ll pay: This seller’s market is expected to continue through 2016 fueled by strong migration to Denver and slow housing starts. Due to price appreciation and increased interest rates, those who buy an average priced home this year will pay around $350 more per month than those who bought the average priced home a year ago. Early house hunters have fewer options: For the past five months, houses under contract have exceeded the number of new listings. Buyer activity increased in March, but new listings continue to remain near record lows. This market compression should start to lessen beginning in April. Prepare to bid above asking price and house hunt during the week: Multiple offers and bidding wars are at record levels and are expected to continue through mid-summer. Homes under $500,000 are expected to go in seven days or less. Based on information from REColorado®, Inc. for the period of March 1, 2016, through March 31, 2016, for Adams, Arapahoe, Broomfield, Denver, Douglas, Elbert and Jefferson Counties. Note: This representation is based in whole or in part on content supplied by REColorado®, Inc. REColorado®, Inc. does not guarantee nor is in any way responsible for its accuracy. Content maintained by REColorado®, Inc. may not reflect all real estate activity in the market.